Nothing too special for today. I needed these guys for the tournament tomorrow. 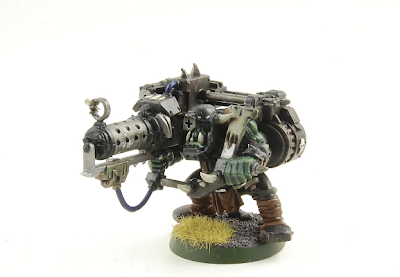 I generally don't like to linger too much on ork units since there are so many of them to paint. No way I could spent as much time on them as for my Blood Angels or even my Imperial Guard or I'd never finish the army. So, another quicky paintjob for this unit, took me around an afternoon's worth of time to finish. I mainly focused on weathering as it's befitting all orks. Lots of armour chipping and washes and I also tried to put some pigments on the Deffguns. Problem is, since these models are for playing and not for display I need to seal them somehow. I use MIG's pigment fixer or turpentine but unfortunately these products tend to eat most of the pigments and not much is left on the model. I then need to add another coat of varnish and do the same process over and over again. It can be very time consuming and even annoying sometimes. Does everyone else faced the same problem or maybe has a solution for it? Comments and feedback are welcomed as always. Wow nice work man.Keep the greenskins up. Thanks! I am painting some Nob Warbikers now for tomorrow but there is no way I can finish tonight. Maybe next week (unless my Stonehorn/Thundertask arrives!). Hairspray will work in a pinch. Also the spray clear coat from Krylon (a US brand) works well. check the auto paint places near you for things that might work.